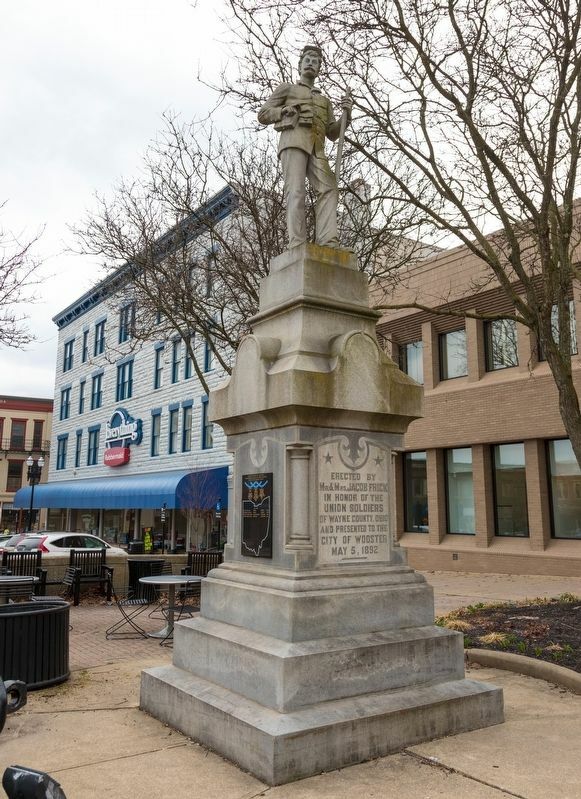 Erected by Mr. and Mrs. Jacob Frick in honor of the Union soldiers of Wayne County, Ohio and presented to the City of Wooster May 5, 1892. 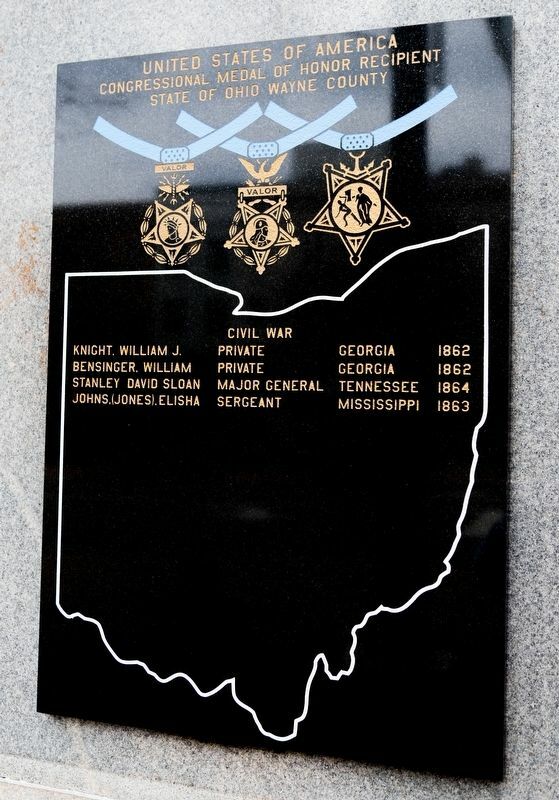 (Known) deceased Revolutionary War Veterans buried in Wayne County cemeteries. Compiled from county records by A. W. Bauman. 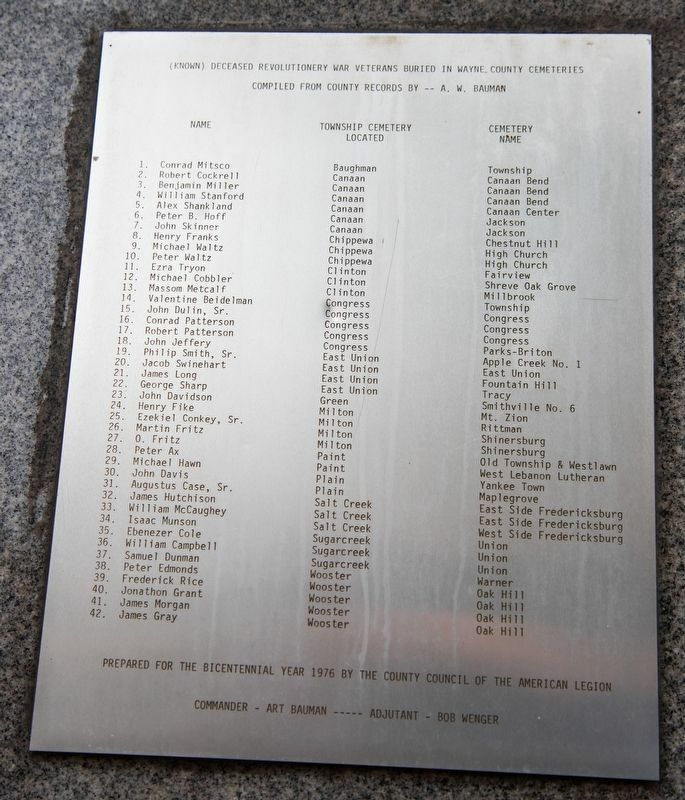 The thin metal plaque appears to be made of stainless steel or polished aluminum. It is affixed to the west face of the monument. This polished stone tablet is affixed to the west face of the monument. Johns (Jones), Elisha, Sergeant, Mississippi, 1863. Erected 1892 by Mr. and Mrs. Jacob Frick. Location. 40° 47.891′ N, 81° 56.406′ W. Marker is in Wooster, Ohio, in Wayne County. Touch for map. Marker is in this post office area: Wooster OH 44691, United States of America. Touch for directions. Other nearby markers. At least 8 other markers are within 11 miles of this marker, measured as the crow flies. Twenty Pounder Parrott Guns (a few steps from this marker); Harvey Howard House / Central Christian Church (Disciples of Christ) (approx. ¼ mile away); General Reasin Beall Homestead / Wayne County Historical Society (approx. 0.6 miles away); To the Heroes (approx. ¾ mile away); Ohio Agricultural Experiment Station (approx. 1.2 miles away); Barnhart Rice Homestead / Frederick Rice (approx. 1½ miles away); Historic John Mishler Weaving Mill (approx. 6.4 miles away); Sonnenberg Settlement 1819 (approx. 10.9 miles away). Touch for a list and map of all markers in Wooster. More. 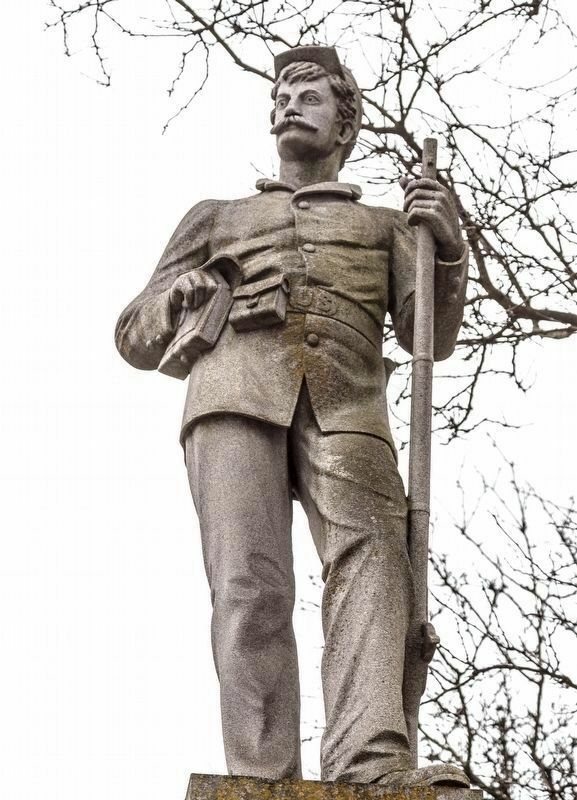 Search the internet for Wayne County Soldier’s Monument. Credits. This page was last revised on April 11, 2019. This page originally submitted on April 11, 2019, by J. J. Prats of Powell, Ohio. This page has been viewed 54 times since then. Photos: 1, 2, 3, 4. submitted on April 11, 2019, by J. J. Prats of Powell, Ohio.